Drunk driving laws contain possible enhanced penalties for repeat offenders, both in court and at the Motor Vehicle Administration. For example, the penalties at the Motor Vehicle Administration for blowing between .08-.14 for a second offense is a 90 day suspension, as opposed to 45 days for a first offense. Similarly, if the blow was .15 or higher, as a second offense the suspension is 180 days as opposed to 90 days for a first offense. For a second or subsequent refusal, the driver is facing a one year suspension as opposed to the 120 day suspension for a first offense. Further, multiple offenders face the possibility of a referral by the Motor Vehicle Administration to the Medical Advisory Board. Such a referral could lead to a suspension or revocation of the privilege to drive, as well as the possibility of a license restriction or interlock. The maximum penalty for a second offense DUI is 2 year imprisonment and/or a $2,000 fine. In court, a second conviction for DUI within 5 years of the first carries a mandatory minimum sentence of 5 days incarceration. The maximum penalty for third or subsequent offense is 3 years imprisonment and/or a $3,000 fine. A third or subsequent DUI conviction within 5 years also carries a mandatory minimum sentence of 10 days incarceration. Incarceration may include house arrest or in-patient treatment. 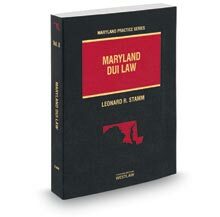 In Maryland, it is important to see a lawyer AS SOON AS POSSIBLE after being charged with drunk driving, to fully protect your rights. Call 301-345-0122 for a FREE consultation with Leonard R. Stamm or Johanna C. Leshner.